One more week and the winter is over. Finally we can hide away warm sweaters, heavy jackets and winter boots, making space for light spring/summer clothes. It’s also a perfect time to refresh our wardrobes with new trending pieces of the season. So let’s check out all the “dos and don’ts” of the coming Spring/Summer 2018. 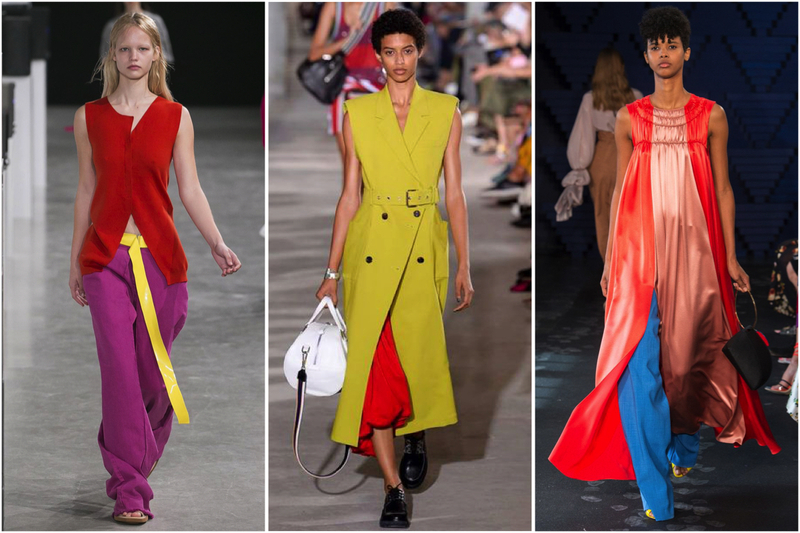 Good news for all those who love bright bold colors. “Tutti Frutti” is everywhere this season! Everything from bright yellow till green and blue are in fashion. All crazy combinations are possible. You can even wear one color head to toe and you will still be in trend! However, one color will take a definite lead within these “Tutti Frutti” mix and it’s the red in all its hues, especially shiny, lacquered red. So, bet on red! Next to the bright colors, all shades of pastels will be in favor this season. Like in the case with bright colors, pastels can also be worn in different combinations or head to toe. In this color palette, one of the leading colors will be lilac, which will become an alternative to the soft pink. The trend of plastic has started already last autumn when Raf Simons introduced his plastic creations for Calvin Klein. Due to its easy maintenance, water and wind proof characteristics, many fashion houses turned towards plastic this season, presenting capes, hats, coats and even shoes from plastic. It seems once again we are going to “spread our wings” with feathers this season. While fabrics decorated with feathers have already been around previous seasons, fringing is something that hasn’t been on the stage for while and made a new entrance this spring/summer. Denim as usual is on the top of the trends. However, in contrast to usual summer light blue hue, this season it is going to be dark and tailored. Trench coats are definite “must haves” of spring season. Next to classic, this season the designers offer altered shapes of this popular item that are decorated with fringing, doubled like a cape or covered with embroidery. Shorts, shorts, shorts…..it’s hard to imagine summer without this wardrobe item. This season shorts will make a new appearance replacing the mini skirts. Ladies who like romantic style, can definitely “ruffle-up” this season. It can be a casual dress or an evening gown, everything with ruffles will be a knockdown. Last but not least the trend of multiple bags. If you have bags of different sizes, no need to wait for the right opportunity to wear them. This season you can easily combine two bags in one outfit, as multiple bags are swags! So, what do you think about these trends? Which one do you like the most? Let me know in a comment bar below!